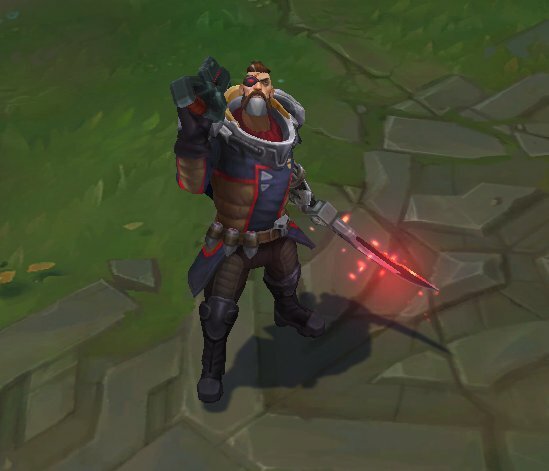 Surrender at 20: Red Post Collection: Camille champion insights, All-Star 2016 Icons & Reminders, Meddler on Syndra, and more! Red Post Collection: Camille champion insights, All-Star 2016 Icons & Reminders, Meddler on Syndra, and more! 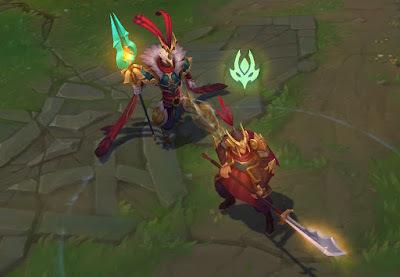 Today's red post collection includes a preview of upcoming skins for Azir, Garen, Vi, and Gangplank, the Camille champion insights article, a fan artist feature on Shilin, Meddler with context on Syndra R nerf revert on PBE, a heads up that champion mastery chests have reset on some servers, 2016 All-Star summoner icons available for purchase & reminders, and more! 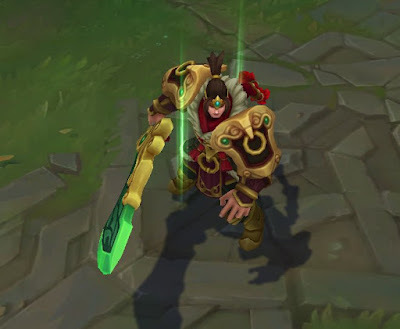 New skins for Gangplank, Azir, Garen, and Vi have been teased on Riot's social media! Riot Ve1vet tweeted these four skins are tentatively priced at 1350 RP and Vi/Garen/Azir will be legacy. Look for these skins to hit the PBE soon as the 7.1 PBE cycle starts. With Camille set for release in the 6.24 patch, here's a champion insights discussing her inspiration and design. 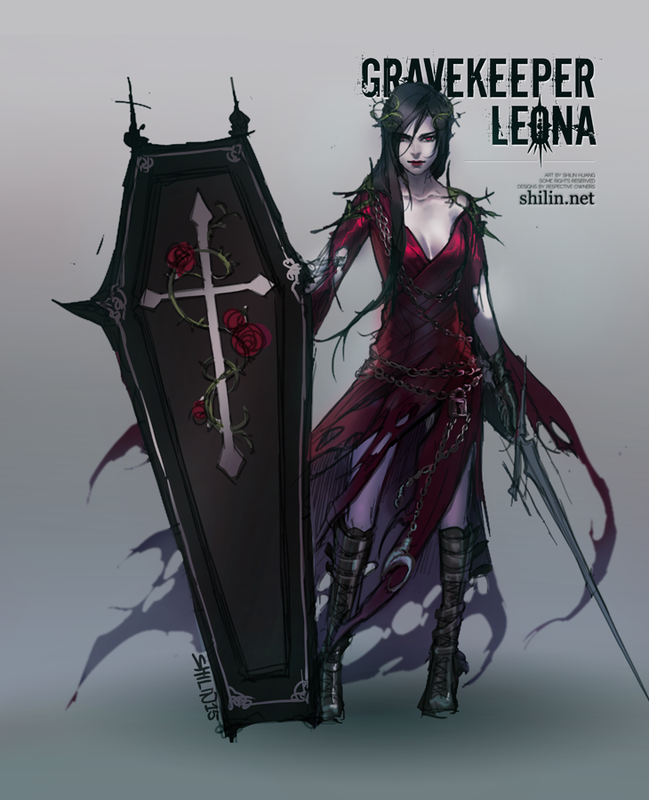 "Sometimes, when we set out to make a new champion, we start with a specific role in mind—like a support jungler. Or we begin with just a theme—like "earth mage." Camille is from Piltover, a city enjoying the fruits of a cultural renaissance. It's flourishing, and the moneyed families who pull the city's strings want it to stay that way. So they employs "fixers" like Camille—dark agents who work to maintain the current balance of power. One key to the current balance is that lower city of Zaun must not rise, lest it become a real threat to the powers of Piltover. Admittedly, Camille has had some second thoughts about her big "blades-for-legs" transformation. "She would never admit it to anyone else," says Thermal Kitten, "but there's a little bit of a question lurking in the back of her mind: has she gone too far? How much more could she augment without losing her humanity? There are a few some combos that'll require even more work to perfect. You can prime her W while you're in the middle of your hookshot/walldive combo so it goes off at the exact moment you dive in on an enemy. 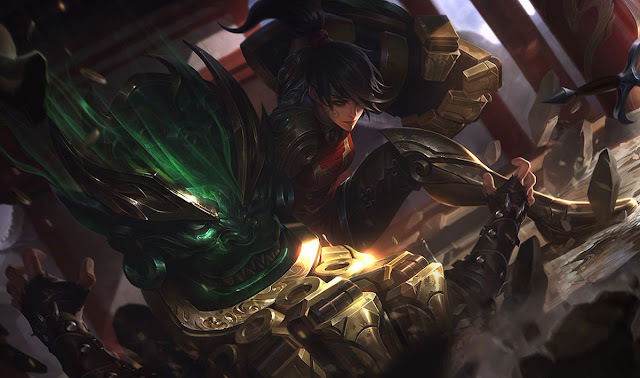 "That's the really flashy play that the playtest team always sends me replays of whenever they pull it off correctly," Riot Jag says. A lot of Camille's early concept art pulled influence from other "cyborg assassin" archetypes from movies and videogames. 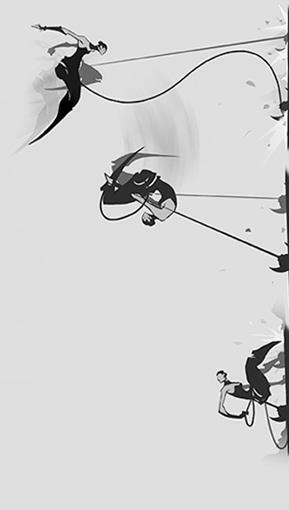 "She’s a James Bond-style agent," concept artist Hing "Hdot" Chui, "but she’s also an elegant lady." 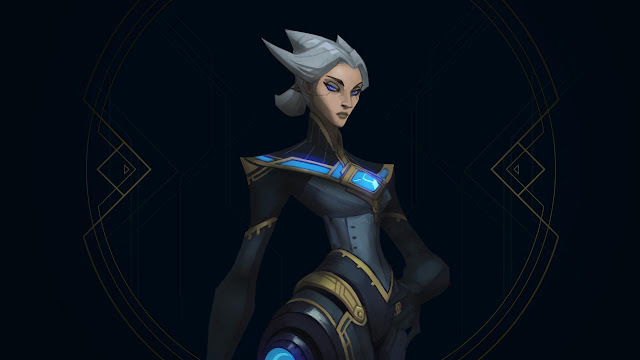 Camille is chopping heads on the PBE now. 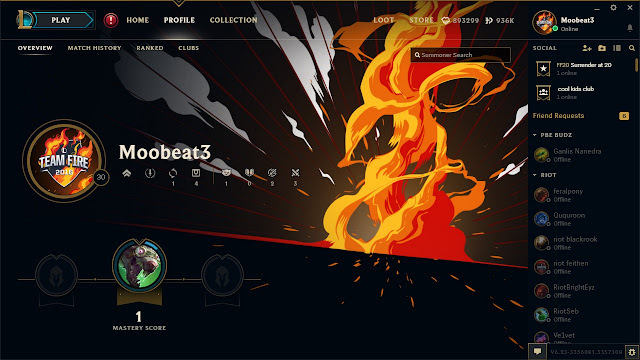 Stay sharp—she'll hit the live servers soon." 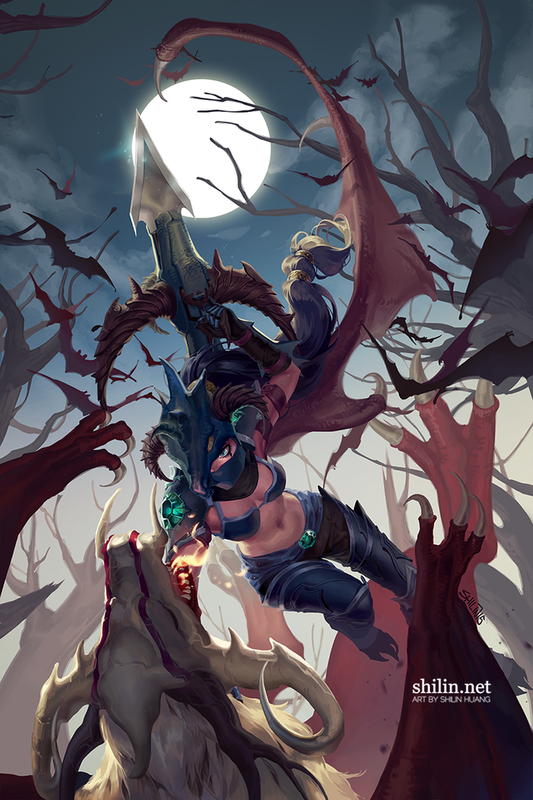 Following the recent launch of the LoL Fan Art Showcase, here's a Fan Artist spotlight on Shilin! Thank you for the opportunity! I am Shilin, and I'm an illustration/comics artist. I've drawn for fun all my life because it made me happy, and even now, it is important that I draw what I want/what I find fun to draw as a career, so you could say I am as serious as I've ever been in my life long drawing hobby-turned-career! I got into League through my girlfriend who played League extensively. It was my first pvp-based game and I was terrified of dying and thus being a burden to other people on the team, so I started and stayed with some supports that had heals. Then after realizing that those poor squishy supports are even more likely to get blown up especially in place of their ADs, I decided to try some tanks to give myself a little longer to live. My favourites to play are Nami, Leona, and Morgana! What do you do for a living? Are you working on art full-time? I am lucky and privileged enough to be able to do art for a living right now! I have a degree in music, but getting that degree just made me realize how much more I'd love to do art for a living, spending my life and time doing what I really want to do, rather than what I feel obligated to do. Nowadays I spend most of my time drawing/writing/self publishing my comic of 10 years and counting, Carciphona. I learned about digital drawing and drawing tablets back in 2000 on Neopets, and at the time it was like witchcraft to me that one could draw on a pad with a pen, and stuff would just appear on a computer screen, or click on the paint bucket and a big area would be filled in with colours evenly. I fell so deep into the digital art abyss because it felt so novel and exciting (and each drawing doesn't cost me dollars in markers and paper lol). Older pieces are much simpler because of my lack of technical skill and understanding of what Photoshop can do, but over time, my drawings become more complex and time consuming. There are many amazing artists that have influenced me over the years, several standing out over short periods as the most inspirational to me, like SR from Ragnarok Online, RA/Rei/Cushart from pixiv, and Cushart to name a few! Artistic influences aren't limited to drawing/painting for me either; photography, movies, even games as an expansive piece of art changes how I see and think about my art, and what I could do with it. Everything gets me thinking! I use Photoshop CC along with a Cintiq 21 UX display tablet. The beginning of a drawing always varies; sometimes I have a clear visual in my head and all I need to do is to sketch it down, and sometimes I need to think hard to place things precisely, struggling and redrawing a lot along the way. After the sketch I would put down very rough colours to give myself a sense of what the final piece would look like overall, so that I could make major changes where I see them without having to worry about deleting work I've spent a lot of time on. Once I'm happy with it, it's detailing for tens of hours until I'm happy with (or sick of) it! There are prolific amounts of tutorials and help posts online these days for learning artists (and we all are learning artists no matter our level), so when I do happen across them, I read them to see what I can learn from them. But in general, I improve just by doing what I like because I'm not keen on structured education, it makes me rather sad and unmotivated about what I do. So in the past 16 years, for every picture I draw, I try to ask myself what I liked and what I didn't like about what I was doing, and used google to help myself overcome obstacles one by one. It is highly inefficient; education could teach someone the same amount of knowledge in a year or two, but the most important part of this method is I get to keep my interest, and I get to enjoy and indulge in art in my own pace, which I believe in the end is what art should do for an artist. I think it's really important for any artist to realize what they like the most about drawing, and how they would like to indulge in that curiosity. For some, formal education is the way to go because some people soak up knowledge so much better that way, and when you derive no negative feelings from formal education, it saves so much time and builds such a solid foundation for the aspiring artist. But don't feel bad if studying is not for you! Draw at your own pace and don't worry about getting to a certain level by some age; it is nice to be able to excel at your craft, but it means nothing to excel at something that you eventually end up dreading doing. Thank you, Riot, for creating a game that inspired so many of us to come together and share our love for art and storytelling! I have many websites, but they are all linked on my homepage, shilin.net, and twitter.com/okolnir. I stream sometimes on twitch.tv/shilin!" 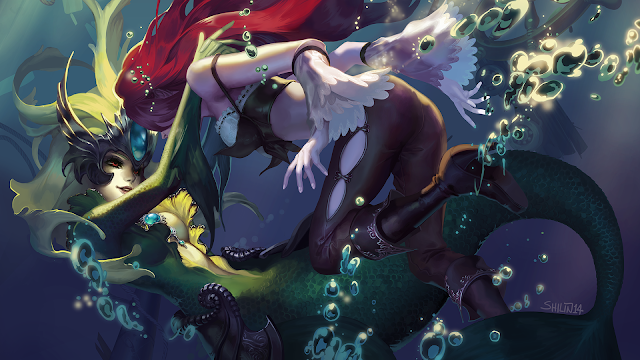 More of Shilin's art available on the fan art showcase or on her homepage, twitch, or twitter. "Syndra's nerf was removed from patch 6.24 because her win rate, ban rate and pick rate all dropped more than we expected. Balance isn't decided by those stats by itself of course, they're a particularly useful guide when it comes to understanding urgency of problems though. When we pulled the nerf we were originally thinking we'd wait and see whether we should add it to 7.1 (the next patch) instead. Current thinking is that we can instead use that extra time to explore better changes than just a base damage nerf (removes some power, but doesn't by itself address underlying problems enough)"
"Mayhem is coming. Who will win your support? Team Fire and Team Ice Icons [December 6 - December 14]: Are you a burning hot flame ready to smoke out your opponents or is your style more of an icy touch that will freeze the heat out of your enemies? You will also receive a themed emote, recall, and LCU profile background based on your fiery or icy choices until December 14 at 23:59 PST. Show your allegiance with a Team Fire or Team Ice Icon for 250 RP. 2016 All-Star Event Icon [December 6 - December 14]: Celebrate the 2016 All-Star Event with the new ASE icon for 1 IP, or you will receive it for free if you voted for your favorite pros earlier this year. 2016 All-Star Event Ward [December 8 - December 14]: With the start of the show, unlock the event ward that combines the elements of Team Fire and Team Ice for 640 RP. 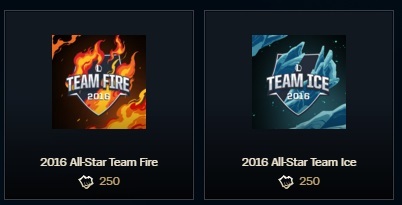 New TEAM FIRE & TEAM ICE 2016 All-Star Team summoner icons are now available for 250 RP each. These specific 2016 All-Star team summoner icons grant unique but temporary cosmetics such as changing the profile background on the LCU and + in-game recall stamps and emotes. These will be enabled through December 14th. Here's a video preview of the temporary in-game effects - Ice on left and Fire on right! Look for the 2016 All-Star event to start on December 8th. There is also an upcoming ALL-STAR 2016 ward skin that will be released sometime in the 6.24 patch. As mentioned above, 2016 All-Star Event kicks off later this week on on Thursday, December 8th! The [2016 All-Star Event Survival Guide] has been posted, detailing schedule, venue, scoring, & more! 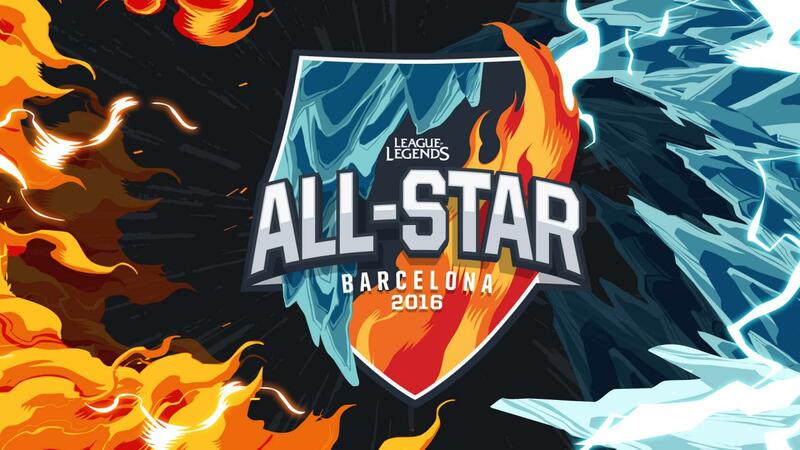 The 2016 All-Star Event will take place on December 8-11 at the Palau Sant Jordi in Barcelona. 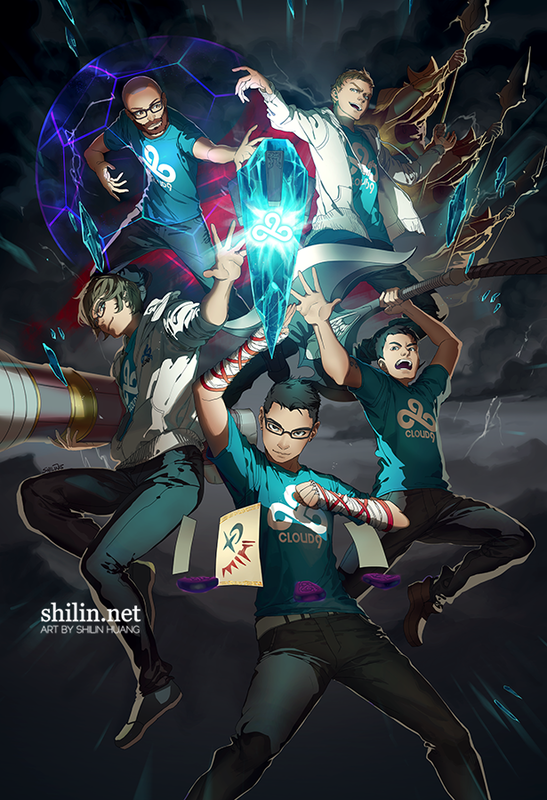 Team info, schedule, and additional event info available via LoL Esports. "Not even All-Stars can be perfect. In preparation for the 2016 All-Star Event, we’re counting down the year’s biggest fails, featuring the pros who will be competing. For even more mayhem, tune in to the 2016 All-Star Event on December 8-11." "In preparation for the 2016 All-Star Event, we’re taking a look at the most hype moments from the masters of mayhem themselves: the Shoutcasters. For even more mayhem, tune in to the 2016 All-Star Event on December 8-11." "Team Ice will be bringing some serious mayhem to this year’s All-Star Event. Here’s five moments that prove it. For even more mayhem, tune in to the 2016 All Star Event on December 8-11." "At this year’s All-Star Event, Team Fire will be bringing the heat...and the mayhem. Here’s five moments that prove it. For even more mayhem, tune in to the 2016 All Star Event on December 8-11." Speaking of, don't forget to check out the THERE WILL BE MAYHEM video featuring a new Pentakill song! Be on the look out for more on 2016 All-Star event and in-game promotions (including icons mentioned above + a new ward skin) as the event starts later this week! New episode of /ALL CHAT is up - this one is titled Threshrun.gif. "On this episode of Summoner Showcase, Jessica and Sam check out an anime-tastic Yasuo vs. Taliyah, a detailed Poppy sculpt, PhyLoL’s OP solo champs, and Champion Thresh running at Worlds! Do you have any art, cosplay, or creations you’d like to see featured on Summoner Showcase? Comment below!" 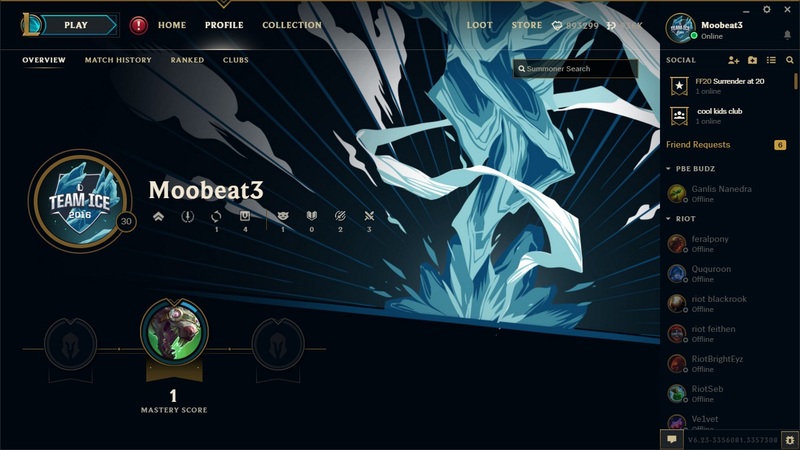 Looks like Champion Mastery grade chests ( that is the ability to get them form game getting an S-, S, or S+ with a champion) has already reset for the season on some servers. While the timing is early, this was expected with 2017 season launching in 6.24! 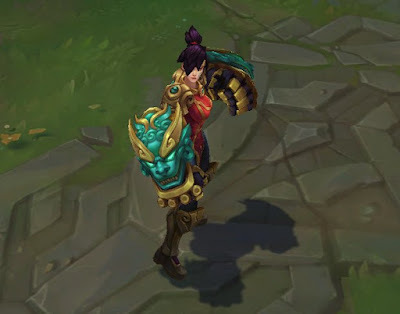 Following this chest reset, your champion mastery score will remain but you'll once again able to earn S grade chests (still one per season) for all champions. Look for more information soon. "We've noticed he isn't doing super great. We are planning on playtesting a couple different changes to see if we can find a direction we like. No promises on anything actually shipping, it's very possible that we find that these changes aren't good for the game. But he is being looked at, and things are being explored." 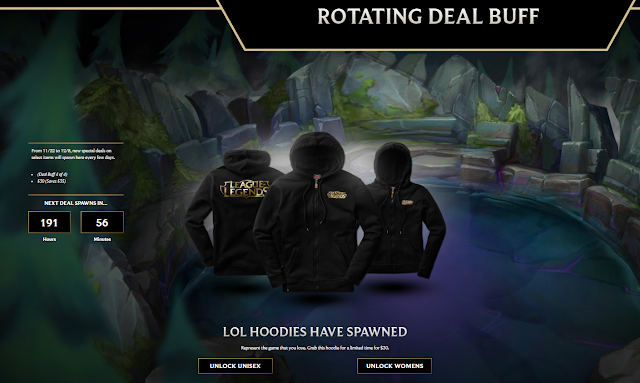 LoL Hoodie is now 50% off through 12/8 as part of the Battle for Baron shop promotion. The 2017 ranked season is set to start with Patch 6.24, target date is December 7th! This will include soft resets for both ranked queues & reset for champion mastery earned chests. More info soon!